DETROIT—For Starbucks, former CEO Howard Schultz is a hero—and a headache. Schultz spent more than 30 years at Starbucks, growing a handful of coffee shops into a global brand. But now as the billionaire mulls running for president as an Independent, the company will have to tread carefully. Some Democrats fear Schultz could tip the 2020 election to President Donald Trump by splitting their vote. But he could also turn off conservatives who will be reminded of his support for gay marriage or his 2017 pledge to hire 10,000 refugees. “I wouldn’t be panicked if I was Starbucks. But it’s not ideal. You’re muddying up the water,” said Americus Reed, a marketing professor at the University of Pennsylvania’s Wharton School. Schultz served at the company’s helm from 1986 to 2000 and again from 2008 to 2017. He stepped down from his role as executive chairman in June and still owns Starbucks shares. His public consideration of a presidential run has already cost Starbucks some customers. Aruna D’Souza, a writer from Williamstown, Massachusetts, was a regular until Schultz made his announcement. She said the company will no longer get her business because of his “pro-billionaire, anti-worker Republican talking points.” She’s buying a new espresso maker instead. But others like Jacob Wilentz, a student at Vanderbilt University in Nashville who goes to Starbucks almost every day, are able to separate the man from the business. “I’m very grateful for Starbucks, but that would not necessarily influence me to vote for the CEO,” he said. For now, Starbucks’ cheerful Facebook and Twitter feeds are focused on promoting the company’s latest latte concoction. But it shared with media a letter CEO Kevin Johnson sent to employees this week after Schultz’s announcement. “Howard has moved forward to the next chapter of his life, where he has expressed an interest in public service, and potentially public office. Whatever he decides, it is my personal belief that Howard will continue to make a positive impact on the lives he touches, and I wish him well,” Johnson wrote. Employees may be asked if they support Shultz’s candidacy, Johnson said, but he reminded them to respect the diverse opinions of Starbucks’ customers. “As a company, we don’t get involved in national political campaigns,” he said. Starbucks has nonetheless been the target of political pushback. Conservatives have slammed the company for matching employees’ donations to Planned Parenthood. Liberals are taking aim as well. Neera Tanden, the president of the left-leaning Center for American Progress, wrote on Twitter that she will organize a boycott against Starbucks if Schultz runs. The impact of a boycott could be limited, judging from the ones that have been staged against the company in the past. The only boycott that appeared to have any real financial effect, according to Bernstein senior analyst Sara Senatore, was in April 2018, when two black men were arrested for sitting at a Philadelphia Starbucks without ordering anything. But that one was hard to measure because Starbucks also closed its U.S. stores for a day for racial bias training in response to the incident, Senatore said. Reed thinks customers who actually boycott because of Schultz will be rare. “It’s easy to jump on the Twittersphere. But it’s a different proposition to say, ‘I am going to inconvenience myself because I am so upset,’ ” he said. Other CEOs have seen their companies come under intense scrutiny when they made the switch to politics. Sen. Mitt Romney, a Utah Republican, faced questions about his private equity firm, Bain Capital, when he ran for president in 2012. And Trump’s businesses have been tarnished by his presidency. Hotels in New York and Toronto have removed his name. Condo prices in his buildings have fallen, and revenue is down at his golf courses in Scotland, Ireland, and Miami. Reed said Starbucks needs a strong social media campaign to distance itself from Schultz and emphasize that it serves everyone. But if it goes too far, it could alienate customers like Shelby Rayburn, a social services case worker who was buying coffee at a Wichita, Kansas, Starbucks this week. “Everybody is entitled to run for president, especially someone like him because he has run such a successful business,” said Rayburn, who declined to reveal her political affiliation. Kelly O’Keefe, a marketing professor at Virginia Commonwealth University’s Brandcenter, thinks Schultz—not Starbucks—should send the message that he is operating independently. “If it comes from Starbucks, it feels disloyal,” he said. Venkatesh Shankar, a marketing professor at Texas A&M University’s Mays Business School, said Starbucks could suffer if Schultz’s media coverage is negative. But if it focuses on positives, like Starbucks’ employee benefits, a Schultz campaign could help the brand. 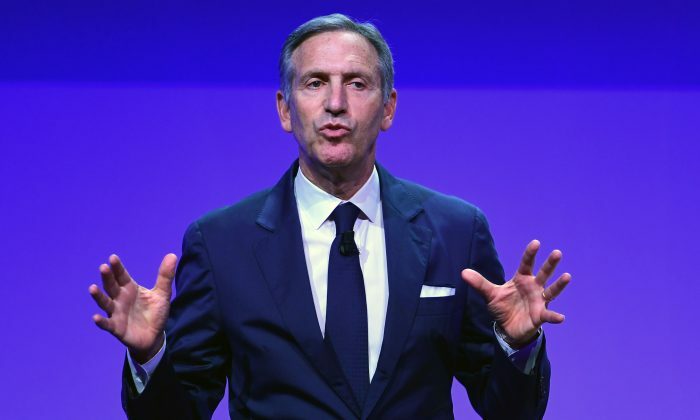 Either way, Americans are about to learn a lot more about Schultz—and Starbucks. Finishing up a vanilla latte and chicken panini at a Nashua, New Hampshire, Starbucks this week, Laurie Ware said she had never heard of Schultz or his presidential ambitions. The 61-year-old cosmetics consultant and jewelry maker said she’s a Democrat and wants to see Trump defeated in 2020. But she won’t forego her occasional trips to Starbucks if Schultz runs. By Dee-Ann Durbin. Associated Press writers Holly Ramer in Nashua, New Hampshire, Roxana Hegeman in Wichita, Kansas, and Travis Loller in Nashville, Tennessee, contributed to this story.